This much anticipated day bring the launch of the book “Mastering the Unpredictable“. I am at the Process.gov event in Washington DC where we are having a small reception to officially launch the book. I will use this post to fill in any details that I can about the book and what is in it. 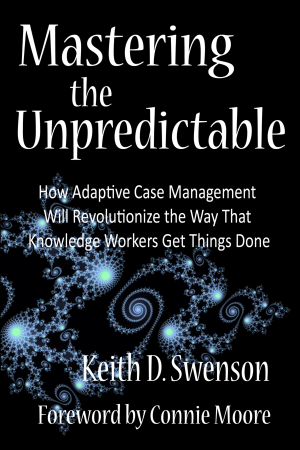 Why A Book on Unpredictable Work? There is a growing feeling that Business Process Management Systems (BPMS) are inadequate for many tasks. When the WfMC hosted a thought leader summit on Case Management in November 2009, we were lucky enough to get the attendance of many key thinkers. I was impressed at how strongly the entire group felt about the need for a different approach. I also the frustration of not being able to be heard. This group has a message, and it is important. There have been a number of (6 to 12 page) white papers in the past few years, but that is simply not enough room to explain the situation to sufficient depth. After such a paper there would be a flurry of confusing responses saying essentially that it is really just a kind of BPM. Followed by a flood of related papers talking about the traditional “pre-programmed approach” but sometimes using the terms of case management. It was clear that something needed to be assembled that was of sufficient depth to explain the entire concept clearly; to hopefully answer every question in a single, organized way. We needed a book of sufficient length and clarity to separate from the fray, and clarify the concept. More than anything else, the single concept that everything pivots on is the idea that some kinds of work are unpredictable. BPM is founded on the principles of Scientific Management and the idea that a process can be isolated, refined, and enacted many times. This mass production approach pays back the up front investment through a small savings on each of large number of identical process instances. There is plenty of such predictable routine work which this approach is good for. We know that not all work is predictable. Knowledge work, for instance, depends in a strong way on the situation, such that you really can not isolate the process into a repeatable form. Just a New Spin on the Same Old BPM? The strongest criticism anticipated will come from many people who will claim that ACM is really just a kind of BPM, maybe with a few things changed. This is normal when someone ensconced in one mind set encounters something different: they recognize the familiar things, but fail fail to see the unfamiliar, and thus conclude it is mostly the same. When you have a hammer, most of the problems around look like nails. While there are many nails, not all of the problems are nails. A screw for instance can still be pounded in with a hammer, so those with hammers will see a screw as “kind of nail with some inconvenient edges wrapping around it”. There are undeniable similarities between a screw and a nail. Those with hammers may view the screw as an “inferior nail”. One needs to stretch out of your mindset in order to see that by using a screwdriver, you can achieve things with a screw that a nail simply can’t do. But if all your experience is with the kinds of things that nails can do, you may not see the need for anything else. A more apt analogy: have you ever wondered why there exist both “word processors” and “spreadsheets” with nearly identical capabilities? Both allow input, position, and layout of text. Both allow any number of fonts and styles. Both have spell check, hyphenation, and other language tools. Pagination is handled. Spreadsheets are grid oriented, but then word processors have tables to lay things out in grids as well. Spreadsheets can do calculations, but then so can many good word processors. They both can embed graphics in the midst of text. They are so similar, why not just have one that does everything? Indeed there was a strong push in the early 1990 to do just this, with what we called “integrated software” (and I was manager/architect of two such systems). But today, we will have both spreadsheets and word processors even though there is a 90% overlap in the capabilities. The reason is that the people using these packages are doing different jobs. When you need a spreadsheet, it is simply more convenient to have a spreadsheet. There is something fundamentally different about these two approaches to do the job. It is not unusual to hear developers and fans of one claiming that it can do everything of the other. In the same way that a spreadsheet is fundamentally different from a wordprocessor, the authors of Mastering the Unpredictable have come to the conclusion that ACM requires a fundamentally different approach from BPM. I must strongly caution you from thinking that ACM is just an adjustment to the BPM approach, or, worse, that ACM is just BPM with a new coat of paint. I will not be able to persuade with a few word or even a few pages. It is natural to have such suspicions, but please read the book, and see if, in the end, our claims of a fundamentally new approach are justified. Another point of much discussion. Just like “Unpredictable” is the key aspect of the work being supported, the ability to “Adapt” the capabilities at run time is the most important aspect of the technology that supports this unpredictable work. BPM is primarily about being “pre-programmed” — just as Scientific Management. Yes, people talk about BPM being agile, but that is agile on a macro scale, often needing a programmer or other specialists to manipulate the process. ACM needs to be agile on a micro-scale, even to the point that in some cases nothing is pre-programmed. The word Adaptive reflects more than simply the concept that it is changeable, but strongly connotes the idea that this kind of change to fit is necessary for every single instance. You can think of BPM as an effort to invent a car that drives itself. You can think of ACM as an effort to design a dashboard that allows a driver to be most effective. Clearly a self driving car is an important and useful goal, but drivers have not been eliminated, and you still need to make drivers effective. And, the way that you would approach a self-driving car would be fundamentally different than the way you would approach the design of a dashboard for a human. ACM will open the possibility of supporting knowledge work, a type of work largely ignored by BPM approaches because it is unpredictable. Knowledge work is by far the most important work today, and it growing to be the dominant type of work in the future. Ironically, this may be an measure of the success of BPM in being able to support a large part of the routine work, freeing up people to focus on more important, and harder to support, knowledge work. My name is on the cover, but I should get credit for “Project Manager” more than anything else. There are 12 authors who contribute 12 distinct voices to the work. We knew that coming to complete agreement would be impossible in a short time — that will take years probably. The table of contents is listed on the web site (http://MasteringTheUnpredictable.com/) and with each chapter is the author and a detailed description of the chapter. Please browse through this if you are interested in what the book covers, and who covered what. How was it done so Quickly? November: thought leader summit, initial discussion of the project, determining the direction. A list of subject that might have to be covered was generated. December: formal proposal for project. I wrote Chapter 1 and distributed to set the tone for the work. Collected subject outlines from all writers, and adjusted a bit to assure that all the important topics were covered. February: rewrite of all the chapters by authors to incorporate suggestions. You might wonder how to find the motivation to persists through these, but for me it was easy: as I read each chapter, my interest in the project continued to grow. March: review by an excellent copy editor (Jill Cooper) who not only checked the grammar and references, but also rearranged large chunks to make the book consistent and understandable. Then she did a wonderful job on formatting the interior to look great. At the last minute Connie Moore (who has been promoting these ideas for a long time) agreed to write the Foreword. April: Peter Fingar agreed to publish through MK Press, and details of getting this to physically to press. And here we are with 350 pages on a very timely subject. I must say that I really appreciate the responsiveness of each of the authors to attend to reviews and rewrites quickly. I am also very grateful for the support of Fujitsu to give me the time necessary to pull all this together. Another irony: many of these concepts are not new, and many of the authors have already written on these topics for many year. What is new is the broad portrayal of BPM (and Scientific Management) as being suitable for literally all kinds of work, and a relative blindness to what it is unable to do. I am sure that if FW Taylor was alive today, he would say that Scientific Management was never intended to be applied to executives, creative people, designers, judges, rescue workers, etc., so we should not be surprised that there is a limit to the effectiveness of BPM. At the same time, BPM has been so successful that more people than ever are doing knowledge work. Dan Pink says in his book “A Whole New Mind” believes that the future will be ruled by right-brained creative people, and ACM is technology to support creative people. We would like to form a new group, dedicated to educating the marketplace, and helping to form what we believe will become a new marketplace, or at least a new category of products. We don’t want to have what happened to BPM, with hundreds of different definitions thrown about, and widespread confusion. This book forms the foundation for a definition of what a product in this category must and must not have, but there is a lot need for extension, agreement, and clarification. If all worked out well, we hope to have an organizational meeting for this new group, a new coalition, in September in New York. Please let me know if you are interested in joining. Some of the other contributing authors have similar announcements: Tom Shepherd, Max Pucher, (and here), Dermot McCauley (and here), Frank Michael Kraft. This entry was posted in Adaptive Case Management, BPM, Workflow and tagged Adaptive Case Management, BPM. Bookmark the permalink. I don’t even know how I stopped up here, however I thought this put up used to be good.